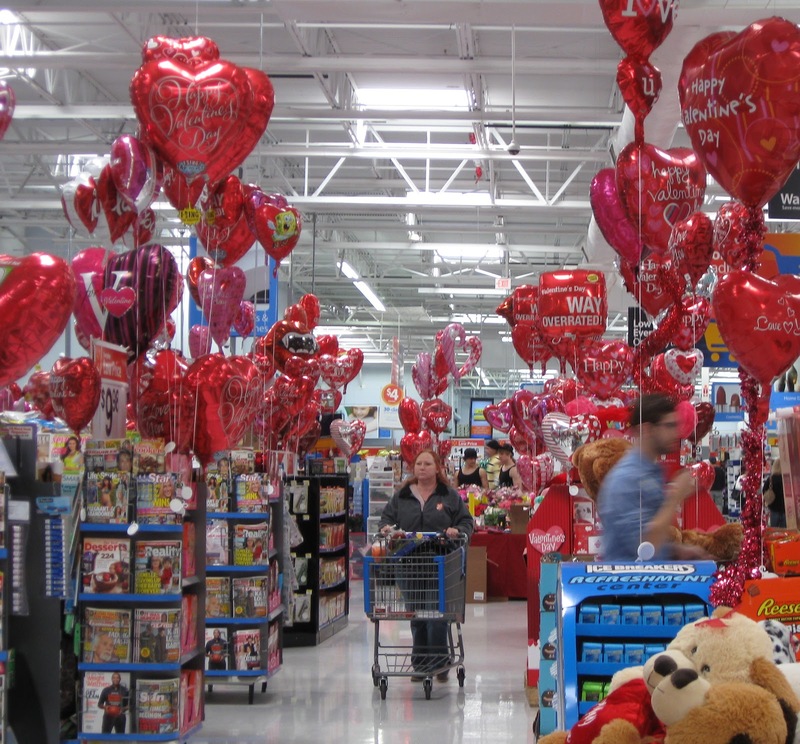 When I first pushed my walker into our local Walmart on the Saturday before Valentines Day, the saturation with valentine shopping choices seemed festive. Shoppers were busy buying, and there were plenty of shoppers. I maneuvered my walker around, hoping to find a spot and an angle that captured the transformation of the entire area from check out to the farthest edge of the wide aisle that runs behind all the checkout aisles. It was over-the-top hearts and flowers in red and white. If ever a rainforest could undergo genetic engineering to accomplish photosynthesis via red foliage instead of green, this was it, the valentine jungle. Maybe on another planet. I finally gave up my photographic effort and launched the search for a number of items I wanted to locate. It wasn’t long before I was exhausted and dismayed. I felt completely drained of physical and mental energy and had not located a single item on my list. I parked my walker in the book section where hubby and I usually meet, then rested and mulled over the fact that I seemed to be losing rather than gaining stamina. - I had noticed that the processes of searching among shelves of different heights, attempting to differentiate among varieties of the same category of food or other items, then reading fine print labels for nutritional or ingredient content, even remembering to relock my walker before I sat down when I had to reposition it multiple times during the hunt for a single item--all were tiring. As I pondered, a breeze, air conditioning maybe, stirred the valentine jungle and focused my attention on the heart-shaped balloons in all their different graphic combinations of red, white and valentine wishes. Insight blossomed. Now I am convinced (almost entirely) that my physical stamina has not been decreasing! My mental stamina has just not caught up. The more abundant the details, the more fatigued I become, and the faster I run out of steam, whether the details are food labels, valentine balloons, layers of sound, or people. Ummm! Relieved and happy sigh! I get it. I totally get it. I understand so completely. Well, I don't totally understand because thankfully I have not had a stroke, but I think you have explained in a very articulate way what I still cannot put into words. All those steps you described on how to accomplish a task. I would have a lot of difficulty with that. I would have difficulty with the searching of the different height shelves. I would not attempt the reading of fine print. Add in crowds, red and white balloons, and noise, and I would have had a melt down. When I first saw your photo, I said to myself, "Wow. If I walked into WalMart and saw that sight, I would become instantly overwhelmed and would turn and walk out. I KNOW you have come a long ways. I think it is important that we assess ourselves realistically, praise what we can do, and let the rest wash off our backs. Thanks for helping me have more insight into where I am also. You are truly a blessing to me. First of all, I love that photo! It definitely is Valentine's Day overload! Wal-Mart is too much mental overload even without all the Valentines!! I get very tired after several aisles, and I am in a a scooter, ha ha! I think your idea is spot on. Maybe a store a bit smaller and quieter? I got tired just looking at the excess in your picture and was glad my Walmart didn't get quite as excited for Valentine's Day. Phew. just looking at this photo made me tired, talk about valentine overload, this is IT... i wonder if our store looked this way. i stay out of stores on holidays and only go early am before the shoppers get there. glad you figured out the reason your stamia was down. Thank goodness my hubby does all of the shopping! I can't imagine going into such a book store - I'll stick to local for food and online for everything else. But well done for doing as much as you are. I think you might have hit the nail on the head with this one. When stores are too crowded or cluttered, I find myself feeling that way too. So glad you are relieved and happy to have discovered this OVERLOAD. Have a wonderful weekend and keep on keeping on!! That sort of thing happens to able-bodied people too. I can't stand the Christmas aisles, or the Easter aisles and certainly not the Valentine aisles. I try to block them out which is very tiring indeed.